Description: Spreading shrub, up to 2 m high. Branchlets ± terete, moderately to densely glandular moderately to densely hairy on internodes and nodes. 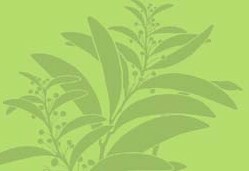 Leaves green, paler below, strongly aromatic; petiole 1.5–2 mm long; lamina ovate, 15–20 mm long, 6–10 mm wide, moderately to sparsely hairy, moderately to densely glandular, margin entire, incurved; apex obtuse; venation distinct, midrib raised on abaxial surface. Inflorescence 8–12-flowered per conflorescence. Calyx green, sometimes with maroon tinge; outer surface moderately to densely hairy and glandular. Corolla 7.5–8 mm long, purple, markings presumed absent; outer surface glabrous basally, distally with a few scattered hairs and glands, especially on lobes, inner surface glabrous, tube 20–25 mm long. Fruiting calyx not or only slightly enlarged (adaxial median lobe-pair 3.5–4 mm long, 4.5–5 mm wide; only immature fruits seen). Mature mericarps and seeds not seen. Distribution and occurrence: Known only from the Goobarrangandra Valley area, part of the South Eastern Highlands Biogeographic Region, and the Southern Tablelands of New South Wales, Australia. This species is locally abundant in a restricted area in open forest dominated by Eucalyptus radiata with dense understorey of Acacia pravissima, Lomatia myricoides, Daviesia ulicifolia, Leucopogon lanceolatus and Pteridium esculentum. It can also be found amongst Bursaria spinosa subsp. lasiophylla in deep shade of a thicket of Leptospermum sp. Soils are recorded as clay loams on Goobarragandra Volcanics on lower slope of steep hillside. Altitude 400–730 m.
The specific epithet ‘makinsonii’ acknowledges the significant contribution that Mr Robert (Bob) Makinson (Conservation Botanist, Royal Botanic Gardens, Sydney) has made to the conservation of the flora of New South Wales. 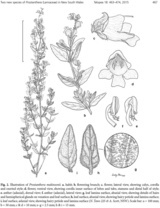 Taxon concept: Barry J. Conn and Trevor C. Wilson (2015) Two new species of Prostanthera (Lamiaceae) in New South Wales. Telopea 18: 463-474.